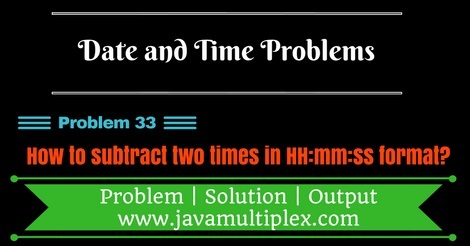 How to subtract two given times in HH:mm:ss format in Java? Home Date Interview Questions Difficult Date Questions How to subtract two given times in HH:mm:ss format in Java? Write a program in Java that subtracts two times that are given in HH:mm:ss format with proper validations. For example subtraction of 12:34:56 and 23:45:23 is -11:-10:-27 or -11 Hours -10 Minutes -27 Seconds. Now convert both the times in seconds, then subtract both seconds and get a new value of seconds. Now divide seconds into hours, minutes and seconds. * @problem How to subtract two given times? Output - How to subtract two given times in Java? Tags : Date and Time problems, Time subtraction in Java, Solution in Java, String, if else statement, Regular expressions.